5 Reasons You Need to Get NET-DYN's 1200AC Dual Band Wi-Fi USB 3.0 Adapter Today! 1. Peak Performance - This USB wireless adapter delivers strong, reliable connections to Wi-Fi hotspots and wireless networks. It includes an internal antenna for even better performance, even for gaming. 4. 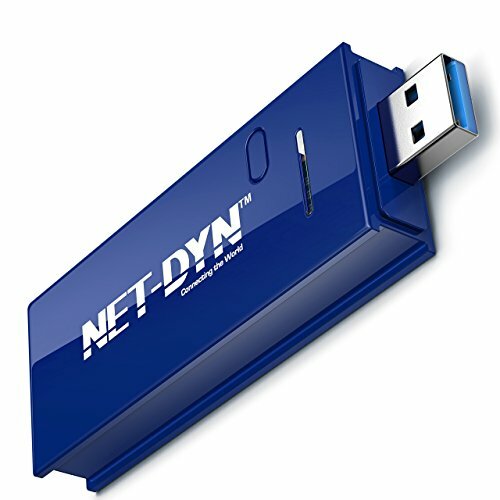 Full Support - The NET-DYN USB Wireless Adapter is backed by English support and consistent driver updates. We frequently update drivers on our website so if you change your hardware in the future, we will have the right driver for you! 5. Quality - Each NET-DYN Wi-Fi laptop Adapter is carefully crafted to provide customers with unmatched performance and quality. That attention to detail is why we are able to offer a lifetime warranty. Dual Band Wi-Fi USB 3.0! ✔ WE OFFER THE ONLY WIFI ADAPTERS WITH A LIFETIME WARRANTY- We want to make sure that you are happy with our products for a LONG time, not just a couple of days. That's why we're constantly updating our drivers for you. Because we stand behind EVERY Dual Band Wireless USB Adapter we make. ✔WE CARE - Net-Dyn is a family-owned business. With various family members scattered around different states and even across different countries, we believe that connection and communication is one of the most important aspects of life. We know that technology can be an incredible gift and are proud that our products can help you connect to the world more seamlessly. ✔SAY GOODBYE TO SPOTTY WIFI DEAD ZONES- You shouldn't have to put up with slow internet speeds at home, even if you're outside. Thanks to this 2.4 GHz and 5.0 GHz USB Adapter you won't have to! With 100 yards of coverage feel FREE to surf from your bedroom porch or garage. It's perfect for gaming as well! IT'S SIMPLE: 1) Plug it in 2) Install the Driver and 3) GO. That's true whether you're using Windows 10 8.1 8 7 Vista XP Mac 10.7 to 10.8. ✔YOUR OWN SECURE WIRLESS NETWORK- The AC1200 series is supported by all WLAN routers: WPA/WPA2/WEP. And it's undisturbed by other normally interfering devices like Bluetooth or cordless phones . Which means you won't have unexpected dropped calls or loss of signal quality. Period. "I'M HONESTLY WOWED AT THE DIFFERENCE IT HAS MADE." - You may be fed up with your old modem or router or have a broken internet card or antenna but you don't need to replace it! At up to 300Mbit/s per band 802.11n, this Wifi Adapter is guaranteed to get you FASTER speeds. If you have any questions about this product by Net-Dyn, contact us by completing and submitting the form below. If you are looking for a specif part number, please include it with your message.